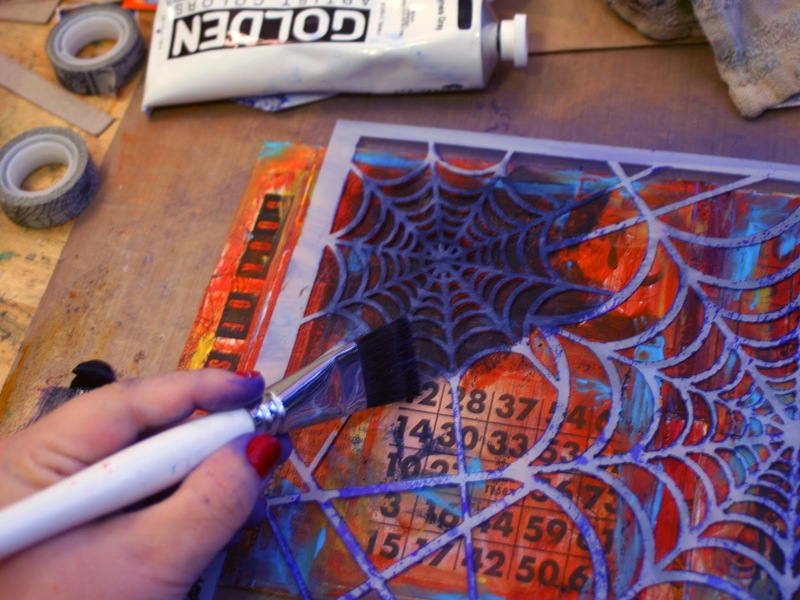 Hi everyone, it's Gwen here again to share a fun Halloween project with you all. 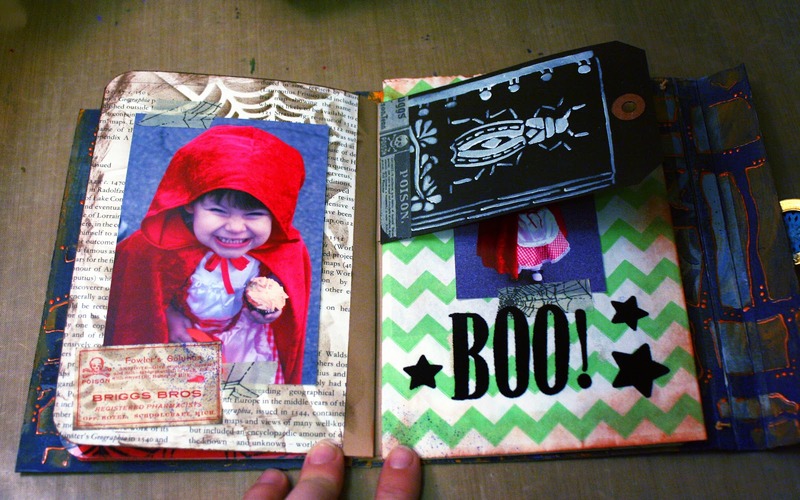 Since the big day is almost here, I thought it would be fun to do something slightly spooky and seasonal, so I combined it with an idea for a handmade portfolio that I've been wanting to try using chipboard, a few stencils, and some Halloween themed paper supplies I had handy. First, I started work on the outside cover. 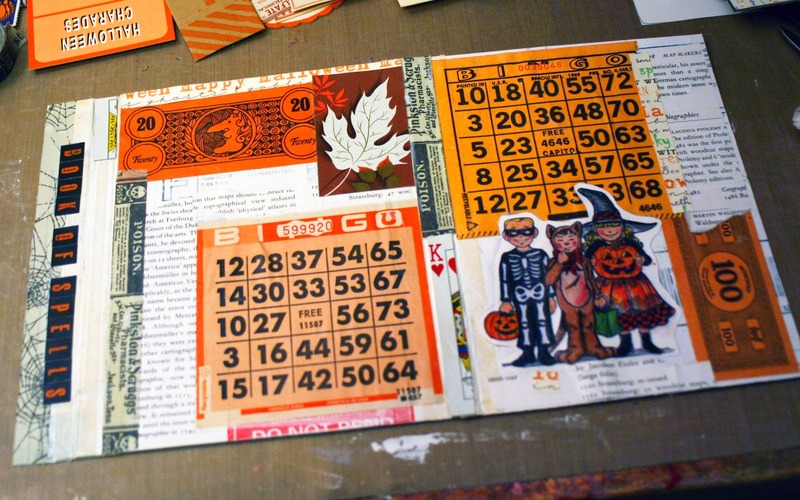 I collaged on some layers of Halloween and other ephemera as the base. 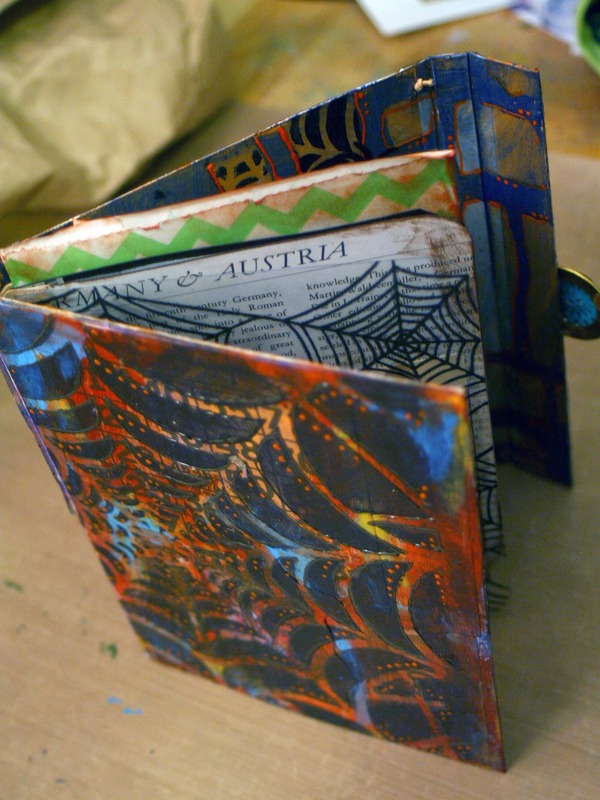 Next, I used the Spider Web Stencil by June Pfaff Daley and some Payne's Gray paint to put on the top layer. Time for the inside! I painted the background purple, then I used the 9x12 stencil from the August 2014 exclusive StencilClub stencils and some yellowish orange paint to add the openings on top. 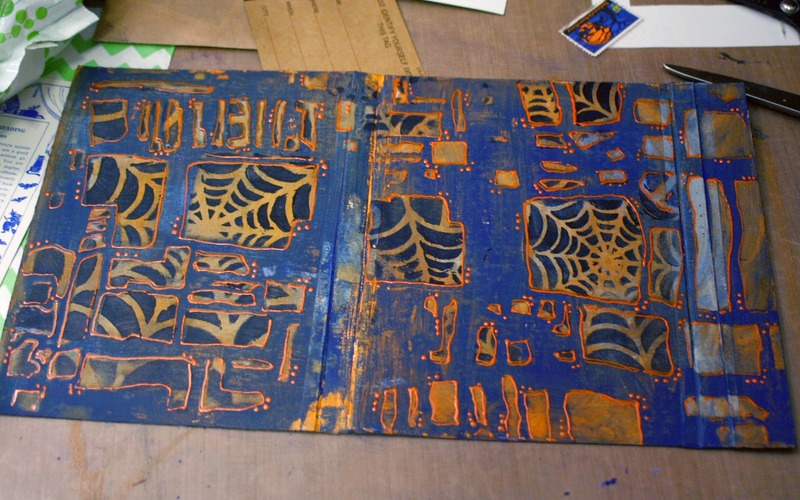 Keeping that stencil in place, I layered the Spider Web stencil on top of that and stenciled it into some of the openings, making sure to only stencil inside the holes so it would look kind of like windows. Then I added more dimensional paints. 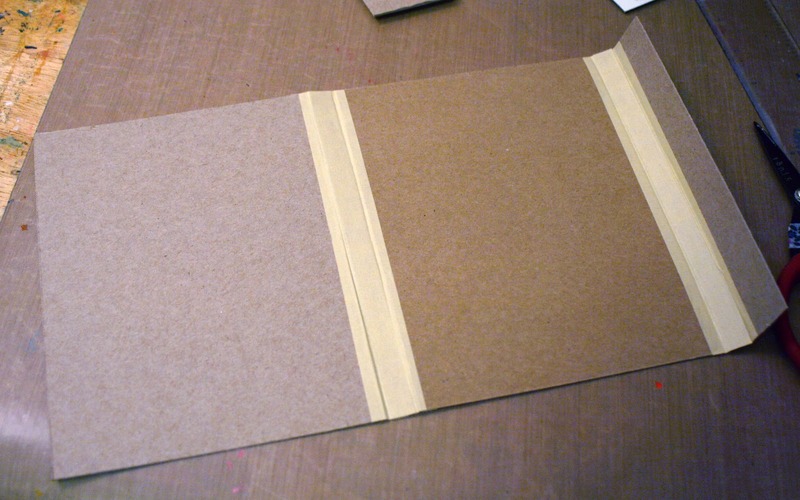 For the inside pages, I cut 6 pieces of kraft cardstock to be about 5/8" x 7", folded them in half, attached paper or tags to one half and then the other half was attached to the spine with strong double-sided tape. 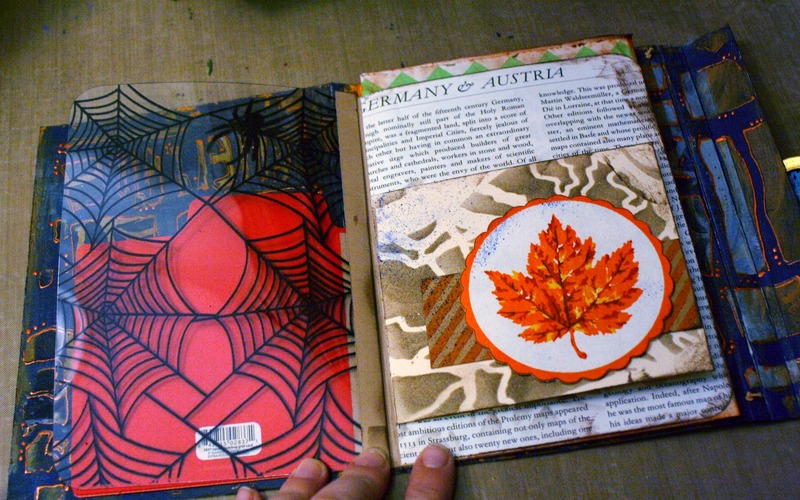 I added all kinds of ephemera to the different pages I picked out, and also added some more stenciling. 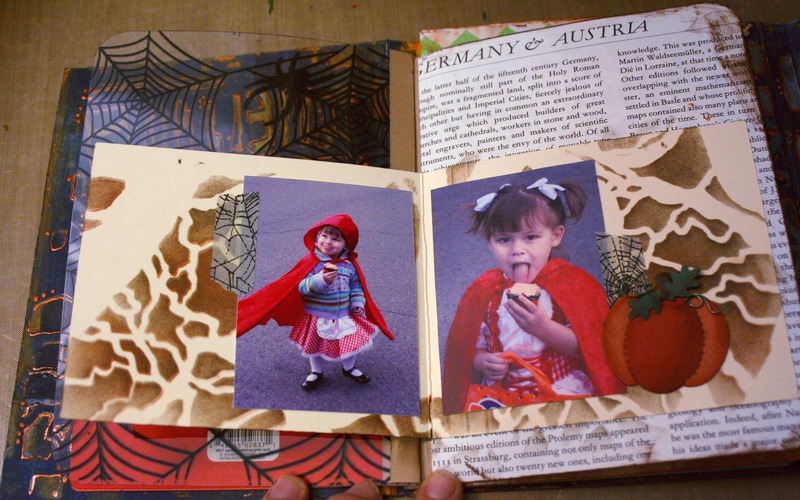 When I was finished, I decided to turn it into more of a scrapbook and adhered in some photos I had of my niece at Halloween 4 years ago... I've had them printed out all this time and figured that this was the perfect time to use them! 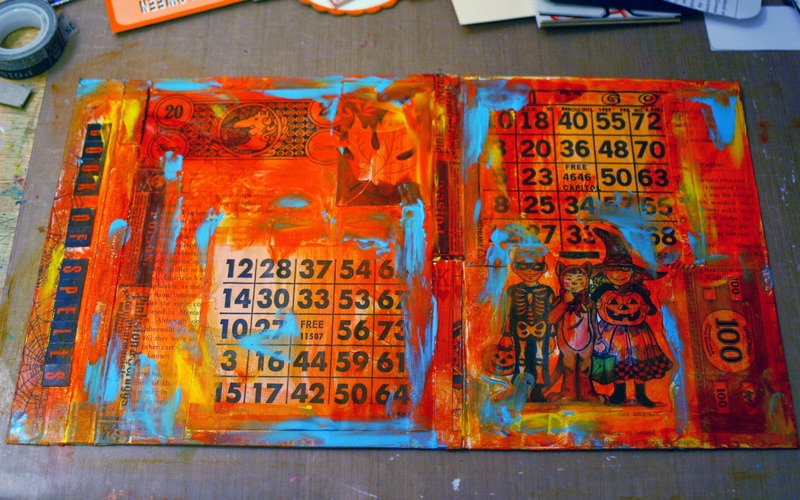 Here's what the inside pages looked like when I was done. 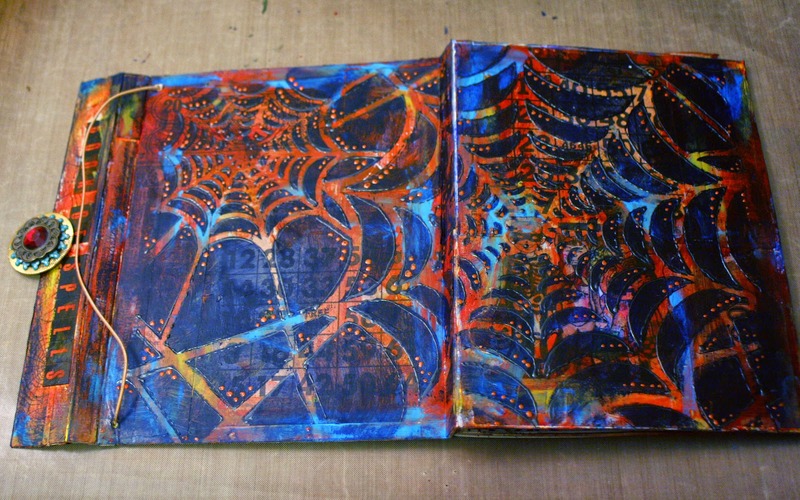 You can see that I used the Spider Web stencil a bit more throughout the inside pages. I thought that the new Fairy Tale Tree Mask by Mary Beth Shaw worked really well as a kind of spooky tree background for this mini file folder insert. And the beetle on the Nature Notes stencil also seemed like a great fit in this context. 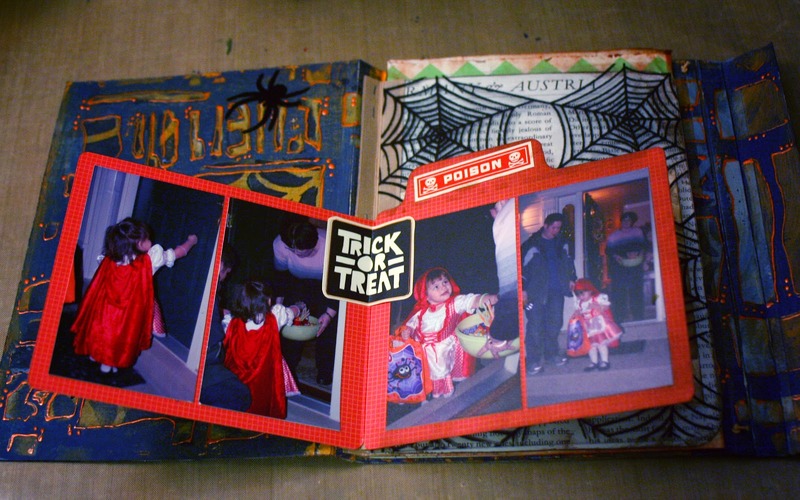 I had some creepy flocked spider stickers from a kit I got years ago that seemed to work really well on the inside covers. Maybe too well! So there you go! 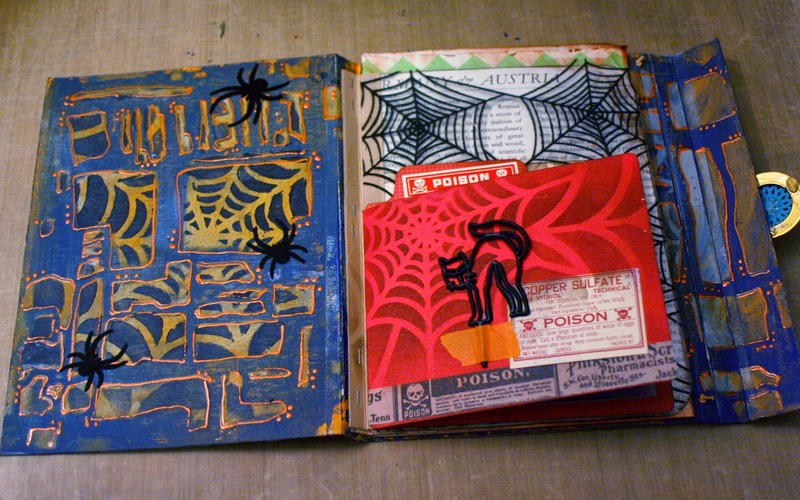 A fun little stenciled Halloween portfolio, perfect as a mini album, art journal, or even a holiday recipe book! I hope you enjoyed today's post, and if you have any seasonal projects using these or other stencils, make sure to link them up! Gorgeous! Loved all your steps! 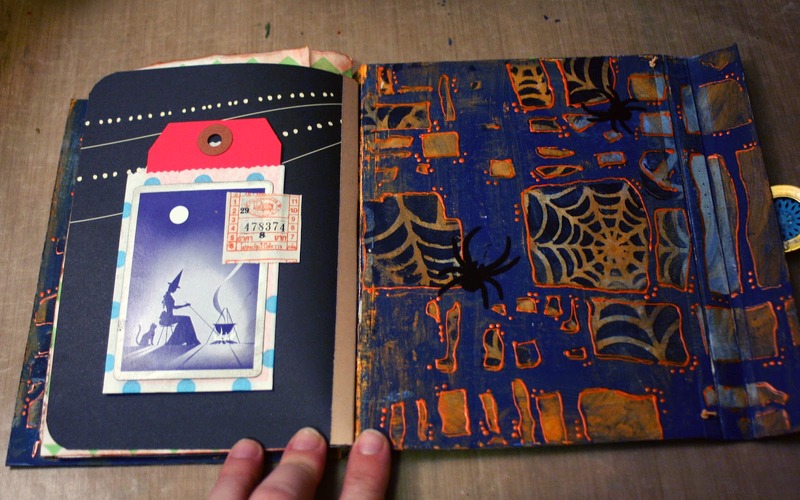 I love everything about this Halloween mini-book and would like to try my hand at making some for Christmas gifts. 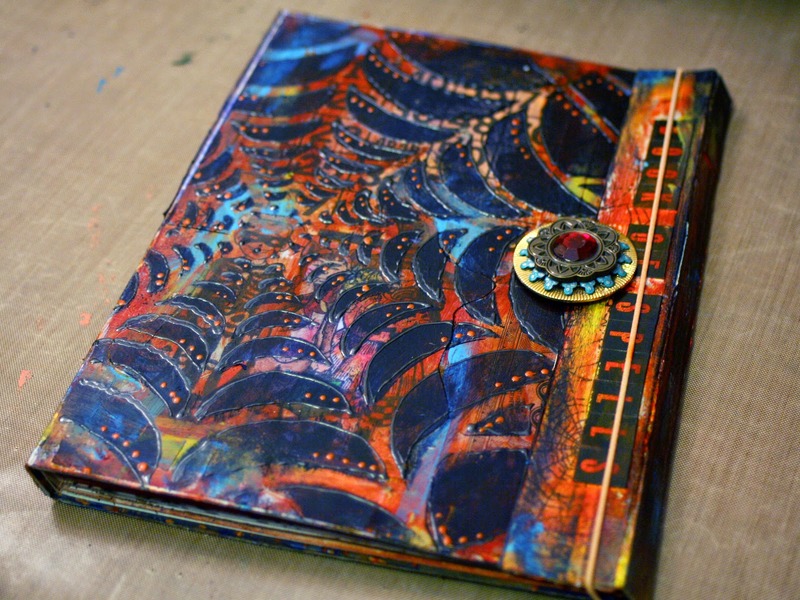 Can I assume that the 3/8" wide piece is used as the spine and the 7/8"wide piece is the flap? Or is it the other way around? Fun, fun, fun! 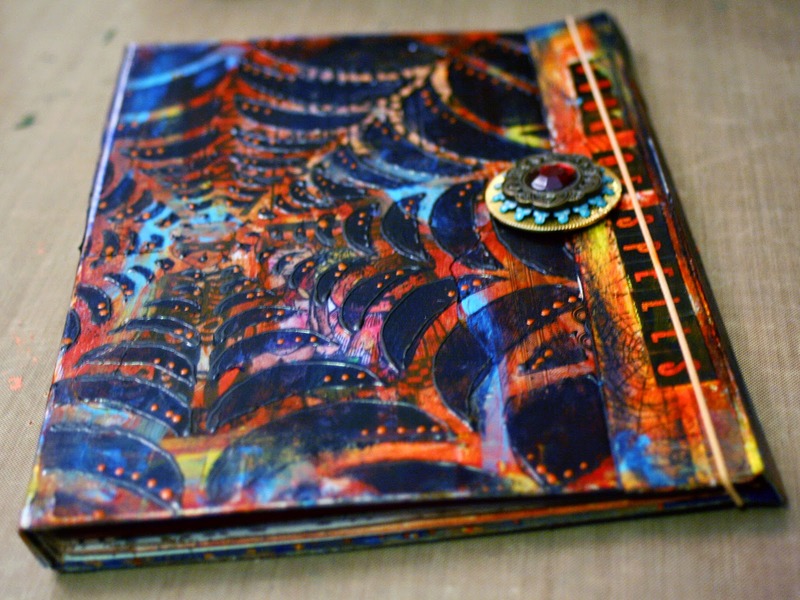 I LOVE this portfolio! Very clever! I think you're a genius! Thank you everyone! Glad you liked it :D If anyone makes one of these, please post it! I would love to see!